Let us know about any other questions you may have ! Why use Owner Assist Remodeling instead of just going to a typical general contractor or architect? Owner Assist Remodeling will work with you to reduce the cost of your home remodel or construction project. We save you thousands of dollars by not charging typical general contractor overhead and profit mark-up, and by allowing you to do a part of the work. You do as much or as little as you are comfortable with, and we do the rest. You’ll save 20% to 40% or more by working closely with us to contract and manage the work yourself, and you can save even more if you are able to perform some of the work. This approach is extremely cost-effective, and much easier than you might think. We give you referrals to trade contractors that will be a perfect fit for you and your project. These pre-qualified craftsmen are highly skilled, insured, and trustworthy. You’ll get competitive pricing, professional workmanship, and the ability to meet timelines. We know the good guys! Can’t I just call three general contractors for bids and compare the price? After all, contractors are all about the same? There are BIG differences between general contractors that are not easily identified. Industry knowledge and experience is one of the major variables, the mark-up they use to cover their overhead and profit is another. Industry Knowledge and Experience. Because there are no specific industry standards for education and training, contractors only know what they have personally experienced. Pulling together a remodeling project that meets your needs using skilled tradespeople and is cost-effective requires careful planning and management of detail. Look for a contractor who has many years of direct experience specializing in exactly what you need. The experts at Owner Assist Remdodeling have completed hundreds of remodeling and building projects and will help you achieve the quality and value you deserve. Pricing and Mark-up. There are hard costs that go into your project, and then there is contractor mark-up for overhead and profit. Some general contractors may claim a low profit mark-up, but what you will not hear about is their large overhead mark-up. Others will cut corners to provide a low bid. With Owner Assist Remodeling you won’t pay for high overhead, and you won’t worry about someone cutting corners. Can I really save 20% to 40% or more remodeling or building my own home? By taking an active role in managing your project you greatly reduce the substantial high across-the-board mark-up a builder charges to cover overhead and profit. We also save you on supplies and materials by using our builder discounts. When you manage the project with our assist and perform some work yourself, you can complete your remodel at very near builder cost. Do I need construction skills or knowledge? A little construction knowledge will be helpful, but it is not an essential part of our formula for success. We can guide you every step of the way. When you manage the project using Owner Assist Remodeling as your coach, you save on overall costs. It is not necessary to perform the work in order to save. How much of the work can I do myself if I have the ability? A little or a lot, that’s completely up to you! If you’re an experienced trade-person, you and your building buddies can save on labor costs. Painting and other finishing tasks are some of the most common work homeowners choose to do themselves, but even providing construction clean up will help your bottom line. Most of our clients act as project manager, and enjoy being involved with all the decision making. 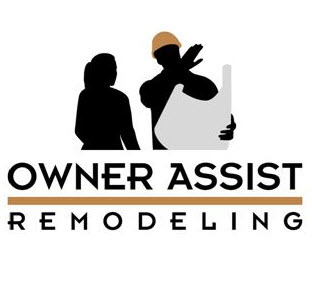 Owner Assist Remodeling is here to show you how, and will be available to answer any questions you may have, or to step in and take over any portion of the management you are not comfortable with. Sounds awesome! What’s the Catch? There isn’t one. We’re the only company that specializes at in-home consulting for smart homeowners who want the flexibility to have their home remodel or new home build any way they want it. You can participate in managing the project and pocket 20% to 40% or more in savings! If you have the determination to make it happen, are willing to be involved in the building process, and are responsible enough to follow through, we can help make your dreams a reality! Are the Owner Assist Remodeling trade contractor fees high or low as compared to the market? While quality workmanship and appropriate match for you is our first priority, we believe that the prices charged by the trade contractors we recommend represent a good value. We work with trade contractors who are known for their competitive bids, high quality, reliability, and professionalism. Their fees vary, as they are all independent contractors and set their own prices. Obtaining multiple bids can be helpful to check pricing on your particular project. “Apples to apples” bids are vital, Owner Assist Remodeling can help you evaluate what services a trade contractor is offering for the price and help you spot potential problems before you make your decisions. How is the Owner Assist Remodeling referral service unique? Most directory services have not actually worked with the contractors they “recommend”. As a local business, Owner Assist Remodeling maintains a network of area trade contractors who meet our qualifications. To be included in our service, trade contractors must meet Owner Assist Remodeling’s strict screening criteria. Generally, these are people who we have personally worked with in the past and had favorable experiences. Our referral service is available only to clients of our planning and construction management services. What are the benefits of using the Owner Assist Remodeling referral service? Our referral service will save you hours of legwork identifying and checking out potential trade contractors. Personal time is valuable to our clients. There is no charge to you for using our service, and you are under no obligation to hire the contractors. You always remain 100% in control of which trade contractors you hire, and are completely free to use a contractor you locate on your own. Does Owner Assist Remodeling guarantee the trade contractors’ work? Owner Assist Remodeling cannot guarantee the work of the trade contractors we refer because they operate independently from us. However, we do offer construction management services so that you can have a professional watching over their workmanship on your behalf. We will also serve as a liaison between you and your trade contractor if a problem arises. Will our project cost more if we use your referral service? Owner Assist Remodeling is not a middleman. We charge a pre-determined small fee to the contractor for work secured through our service. Our trade contractors consider our services as a marketing expense for their business. Who will pull my building permit? You have total flexibility with the permit application – as with everything else. We can take care of everything for you, or we can help you prepare the permit application, and you can submit it yourself. Most cities, counties, or municipal governments provide user-friendly processes, provide the necessary forms and explain how to submit them. Many cities and counties also have informative Web sites that explain the whole process. How will I know the work is done right? We have identified outstanding trade contractors who want to do the work right for you the first time. We also provide services to monitor the workmanship of any trade contractor you choose. Before the work begins, we meet trade contractors at your home to show them your project and talk them through the details so that you get thorough bids. We schedule the work, get the process started and ensure that good dust and surface protection is in place. We’ll check workmanship during the job and again after completion, and create a “punch list” if needed. Local inspectors will also be monitoring your project at various mandatory inspection stages. Who picks the materials that go into the project? You do. You can shop where you like and where you find the best prices. Some homeowners shop at home stores, some at our builder supply showrooms, and some use the Internet. Owner Assist Remodeling clients have access to the same suppliers the local builders use, and we pass along our builder discounts to you! What if someone does something wrong—how does it get fixed? When you manage your own project, you are the one in charge and ultimately responsible. However, we’ll work with you to ensure the trade contractors return for corrections and take care of problems. Our contractor referrals are loyal to our clients and work hard to make sure you are satisfied. Of course, if you select our full design build service, we are responsible for everything. You do. You receive all the invoices and write the checks. We can help you prepare a budget so you can monitor costs associated with your project and know exactly how you are doing. I already have a full time job. Do I really have the time to manage a remodel of my own home? You only need to do as much as you are comfortable with. In the planning stages, we work at your pace. Most trade contractors are willing to work around your schedule for bid appointments. After construction starts, most owner/builders spend 1 to 3 hours a day managing their project. We are available to step in at any point if you don’t have the time or if your situation changes. Can I use my own trade contractors, and can I do some of the work myself? Absolutely. We encourage you to do as much of the work as you feel comfortable doing. You can use your own trade contractors, but should check to be sure they are insured. This is your project. You’re in charge. How do you charge for your services? Are the rates hourly or a flat fee? Our compensation is based on the amount of time we spend on your project, how much you want to do yourself and how much you want us to do. Every project is different, just as every homeowner is different, so our flexible services allow you to use us where you need us. Our fees can be hourly, as a percentage of the project cost, or by bid. Hourly rates will vary dependent upon the work being performed and the number of hours involved. They typically range between $50 and $95/hour. A retainer agreement based on an hourly rate is common and typically fair to both parties. We will discuss all of this in more detail when we understand your needs and desired participation. Does this service work for building a custom home? Absolutely. Our experience, trusted trade contractors, and established material suppliers will all help you save when building a home. Just imagine: If you cut the cost to build by just 10% acting as your own general contractor on a typical $300,000 custom home project, you’ll be putting $30,000 worth of immediate equity in your pocket the day you move in! Who wouldn’t want to move into a brand new custom home and have that much instant equity? It can take between 6 and 10 months to build a new custom home. You will need additional time for design if the plans are not yet drawn. Good organizational skills and timely decision making will keep the project moving forward. Changes and slow design decisions are things that can cause a project to stretch out.